Steven Sonntag outside of the BMW headquarters in Munich, Germany. Studying abroad in Germany was always part of Steven Sonntag's plan, even before beginning as a freshman in the Honors College in 2013. However, the extent of time he would spend in the country and the varied experiences he would have there were far beyond his imagination. Sonntag, who started at the University of Arkansas as a mechanical engineering major, has always had an interest in learning the language of his ancestors. He took German classes in high school and continued developing his language skills in German courses in the J. William Fulbright College of Arts and Sciences' Department of World Languages, Literatures and Cultures. When he learned about the university's International Engineering Program, which allows students to earn degrees in both engineering and German, he knew it was an opportunity he had to pursue. As part of the International Engineering Program and with the support of a Benjamin A. Gilman International Scholarship, Sonntag spent the fall 2016 semester as an exchange student at the Technical University of Darmstadt. Before arriving in Germany, the U of A junior passed the Goethe-Institut B1 exam, certifying him in intermediate to advanced German language proficiency. However, he quickly learned his language ability, especially in relation to engineering terms, wasn't as good as he thought. "My German has improved exponentially since I've been in Germany, but the first two months at the university were really difficult, because each subject has its own specific vocabulary and way of speaking," Sonntag said. "It wasn't until the third month of engineering classes that I began to feel more comfortable and understand the material being taught." 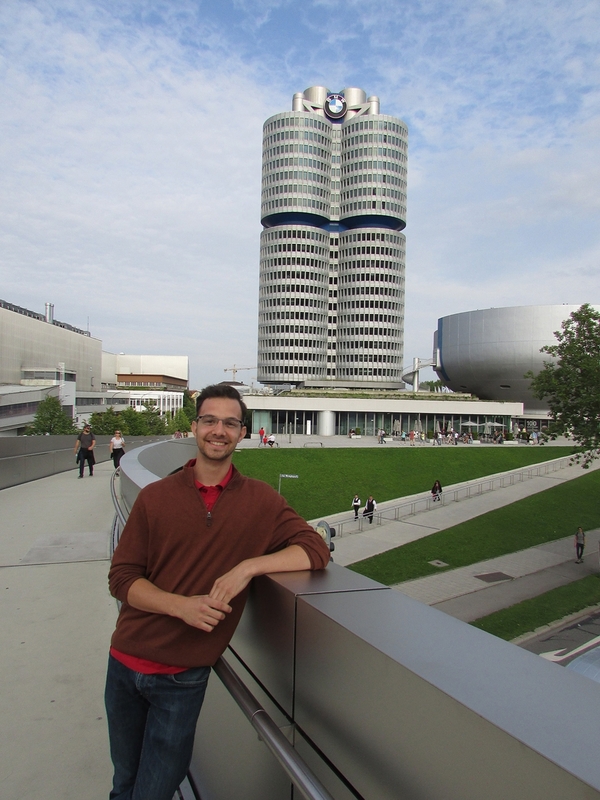 After passing his final exams, Sonntag began the second half of his experience abroad in the International Engineering Program by earning an internship at BMW's Munich headquarters. As an intern, he has conducted quality analysis of competitor car interiors, created a program that automates data collection and analysis and test driven competitor cars to check suspension, handling and dynamic performance. "I applied for internships at several automakers, but working at BMW was always my dream," Sonntag said. "This experience has taught me that, as long as you try your hardest and put effort into the things you want, you can make them a reality." Though being immersed in a new culture and new country has been a life-changing experience for Sonntag, it has also come with some unexpected challenges. "When I moved from Darmstadt to Munich, I wasn't sure if I had to re-register as a resident of Munich," Sonntag said. "When I received my third pay check from BMW, I noticed I was suddenly being taxed at the country's highest tax rate. I called the tax office to find out what was going on, and they explained I was being taxed at that rate because I had been de-registered in Darmstadt and wasn't a resident of Munich yet. My only options were to pay the taxes or declare myself homeless. So, for a month and a half, I was officially considered homeless in the eyes of the German government." The honors student is looking forward to telling that story with a laugh for years to come. Sonntag, a native of Rogers, Arkansas, will return to the United States later this year and will resume classes at the U of A in spring 2018. He expects to graduate with both mechanical engineering and German degrees in December 2018.